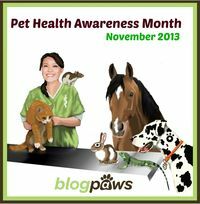 This November is BlogPaws' Pet Health Awareness month, a time to learn and share ways we can improve, maintain, and protect the health or the animals in our care. Not only do I care about the health of my own pets, but I am also concerned about the health of my clients' pets, and I want to make sure I'm always an extra set of eyes looking out for any potential health issues. When I meet a client for the first time, I always ask detailed questions about the health of their pet. Do they have a limp that is normal for them? Do they vomit frequently? For how long and how briskly are they usually walked? How do their medications affect them? I like to know what is normal for the individual animal so that if I notice something out of the ordinary, I can report it to the client. Each time a client books service with me, I ask if anything has changed regarding the care or health of their animal. In addition to getting to know the animals in my care through their owners' eyes, I make my own observations each time I see the pet. Part of this is a nose-to-tail check. A nose-to-tail check doesn't have to be a formal event. The animals never even know I do it. I just pet them and feel around for differences in their coat or weight or skin. I feel and look for lumps that may have gone unnoticed by the owner. I look into their eyes and mouth, if they will let me. It's nothing as formal as a check-up at the vet (I don't put a thermometer you-know-where), but being able to let the pet owner know about any changes I've observed can be very important. When they see their pet every day, changes can be difficult for them to notice themselves. You can do this with your pet once a month. It's like a self-exam you might do on yourself. It's no replacement for a professional medical assessment, but it can often help catch things long before they may have been caught otherwise. How do I do a nose-to-tail check? • Make sure the pet is calm and comfortable. • Start at the nose and focus on how your pet feels and what they look like. Look inside the pet's mouth, if they will allow it. • Observe any changes in your pet's eyes. Is there discharge or do they look cloudy? • Move your hands over your pet's head and neck, feeling toward the skin for any abnormalities. Be gentle, and let your pet feel like he's getting a massage. • Look at your pets paws and claws. • Move your hands over your pet's body and investigate any lumps. If benign lumps are known, keep an eye out for any changes. • Do the same for your pet's tail, if he will allow it. Overall, you are looking for changes. If you observe changes, it might be a natural part of aging or your pet's environment, or it may be the sign of something more serious. It is always a good idea to write down any suspicious changes and report them to your vet as soon as possible. Most of the time, the changes I notice turn out to be nothing–thank goodness! But the pet owners appreciate the fact that I am paying attention and that I care, and when we work together to make sure the animals are as healthy as they can be, everyone wins. What do you do to make sure your pets are healthy?